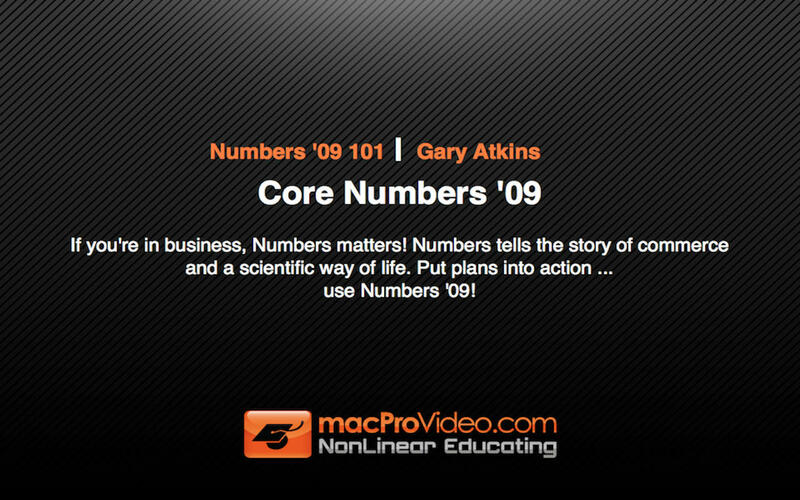 Numbers '09 is an incredible application for creating spreadsheets on the Mac. With its deep formulas, integrated graphing features, and the ability to copy and past tables from web pages and other documents directly into your numbers project, Numbers '09 is your go-to app for any Mac-based spreadsheet application. In this 5-hour title by macProVideo.com trainer Gary Atkins, you'll learn how to create formulas, format tables and cells, create intricate and descriptive charts, and work with multi-table spreadsheets. you'll even learn how to insert graphics and other media into your spreadsheets to really spice-up your display! This is a comprehensive tutorial, but you don't need to watch the entire show. Use the detailed menus and keyword search functions to quickly find items of interest. For a full list of this tutorial's topics, check out the Table of Contents!